24. Lappula Moench, Methodus. 416. 1794. Brand in Engler, Pflanzenr. iv. 252.136.1931; M. Popov in Schischkin, Fl. URSS. 19:403.1953; Riedl in Rech. f., Fl. Iran. 48:68.1967; Kazmi in J. Arn. Arb. 51(3):499.1970. Usually annuals. Calyx deeply 5-cleft, barely enlarging in fruit. Corolla funnel-form to ± campanulate, blue, sometimes white. Throat scales present. Fruiting pedicels short. Nutlets erect, ovoid-triangular to ovoid, surface tuberculate-verrucate, attached throughout their length to gynobase, sometimes heteromorphic, with nutlets winged or not, bearing glochidiate aculeate marginal appendages or toothed. Gynophore arising above the nutlets or not. Style hidden by nutlets or not. A difficult genus of 45-50 species whose limits are not well defined due to possible hybridization. 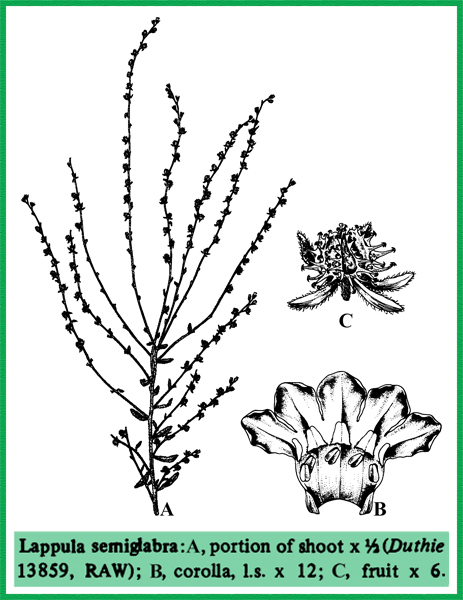 Closely related to Hackelia Opiz & Heterocaryum A. DC. The nutlet character is of importance in delimiting the various species and hence fruiting material is desirable or essential. Distributed mainly in temperate Europe and Asia, Australia and America. Represented in Pakistan by 9-10 species. Lappula squarrosa (Retz.) Dumort., Fl. Belg. 40.1827; Edmondson in Davis, Flora Turk. 6:258.1978. Myosotis squarrosa Retz., Obs. Bot. 2:9.1781; Myosotis lappula L., Sp. Pl. 131. 1753; Lappula echinata Gilib., Fl. Lithuan. 25.1781, nomen illeg. : Lappula myosotis Moench, Methodus 417.1794; Riedl in Rech., Fl. Iran. 48:71. 19 7; Kazmi, l.c. 510. Closely related to Lappula heteracantha, but with the outer series of appendages of nutlets more or less equalling the inner series. Distribution: C. & E. Europe, URSS. Iran, Afghanistan,? Pakistan. Introduced to S. Africa and N. America. Kazmi cites several gatherings (Kazmi, l.c. 511). The gathering R.R. Stewart 600 from Ziarat cited by Kazmi (1.c.) is Lappula microcarpa. Aitchison 198! (GH) is difficult to determine as it is not in fruiting stage. I have not been able to verify Crook-shanks gatherings that Kazmi mentions.